No I didn't take the picture - it was one of Cracker's crew, Cali and she is self evidently V brave! 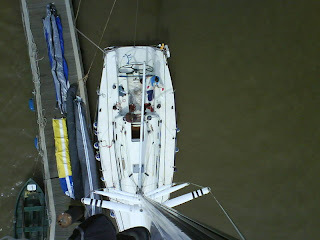 Looking down on Cracker you can see people, sails on the pontoon and the three sets of spreaders needed to hold up her rather tall carbon mast. Cali was up there servicing the host of sheaves and other bits n pieces that keep all the ropes running nice and freely around the racecourse. Oo er!